Low Tide can be your home away from home! This rental is located in the Ocean Drive section of North Myrtle Beach across the street from the beach. Enjoy the Ocean Drive Difference by starting your vacation immediately upon arrival, as this property comes with fresh bed linens/bath towels, the beds are already made up for you, and the departure maid service are all included in your price. Beautiful ocean views can be seen from master bedroom, living and dining room, kitchen and two decks. Low Tide offers five bedrooms with four full bathrooms and a fully equipped kitchen. With a short walk across the street, you will have your toes in the sand in seconds. Maximize your time on the beach with this rental. Its close proximity to the beach and popular area attractions will help you make the most of your time. Low Tide is a wonderful home and will give you enough room for you and your entire family for a relaxing, beach vacation. 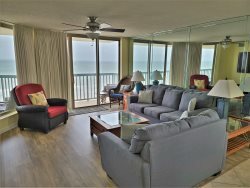 Take time and reserve this rental today in planning your next visit to the beach!